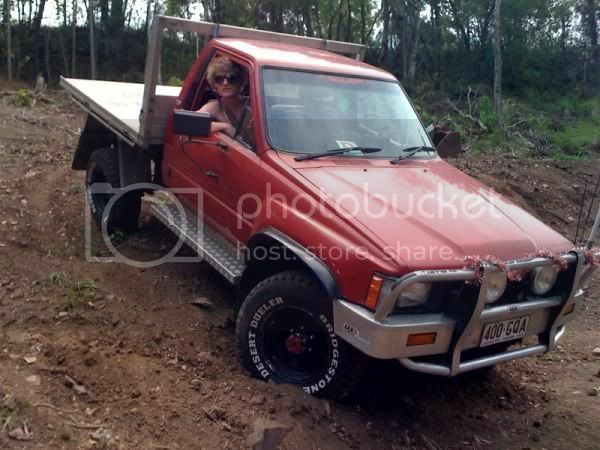 mine was a 1979 hj45 H motor rusty old ute. unbreakable and went were it was pointed. 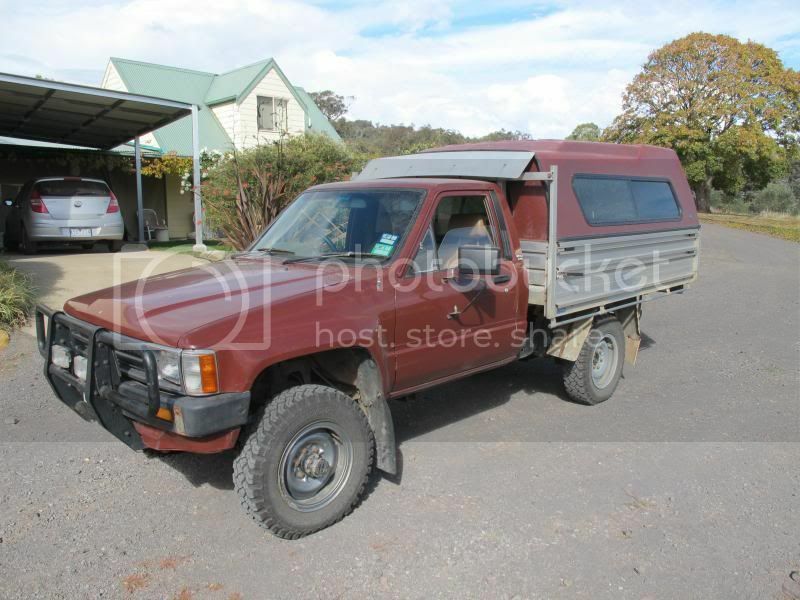 my first ute was one of these , rusty & knocked around, Ended up as a paddock basher. In the 70s you couldnt give away old Eks and FBs etc Even tho they were quite servicable. We used to pick them up just to paddock bash them, Now you can hardly find a good one. A few vehicles later I had a '99 dual cab rodeo for work (in shearing sheds). I miss having a ute now but my station wagon is pretty comfy (not very roo proof tho). EJ grey motor for bush bashing- fully rusted out(ended up as gully fill), and regoed EH 149 purple people eater . Carted firewood every trip into uni(Forestry). Had an old dodge 245 ute in high school - one of the fastest around in its time. 1980 Holden WB ute. HZ front end, Varajet carby on 202 blue with extractors. Tri matic behind a highway cam. Biggest rust bucket ever but started every time unless the alternator had **** itself. Threw some VS seats in her and I fully carpeted the interior myself. I did love it. Been a Toyota man ever since. The ute that I have now is my fist ute that I've owned. 2006 79 series Landcruiser. Plan on keeping this thing for quite a while. I'm a big fan of the old ln65 luxes. They are simple to work on and there's heaps of spare parts. This is mine, low k's for her age (under 200k) and no rust. 75 vj valiant ute - factory 265, 465 holley on long runnered lynx manifold, headwork (mum polished the head!!!) bit of a cam, charger close ratio four speed with shortened shifter,went bloody hard!! 13.1 @ 106mph hard. Great fun. Modded a zj fairlane slippery had 2.72 ratio n four wheel discs - not an option on the old val!! 90kmh in first gear lost about 25 demerit points in 12 months before the law caught up with me gun metal grey dumped 3" and was running out of the extractors - that may have had a bit todo with the law frowning on me also had a chrysler by chrysler front on it and the jellybean mags and rolled guards. Loved that ute, sold it to some clown who promptly smashed it. I did warn him. Idiot. First and current fourby is my mk triton - lifted, loud, obnoxious, a stereo that would surprise most comp cars (chock full of alpine gear - 4x 6.5 type r splits, 2 alpine pdx amps 1 stereo other mono, 2 12" option subs in a dual cab no less!!) 32" bighorns, snake extended shackles uhf led bar + ipf spotties bout to convert to hid, iphone hands free (strike smoothtalker), tough dog suspension, horrible on fuel, but love it all the same. Bought it 4yr ago with 90k on the dial - now has 289k. Only issue done three fuel pumps. Need a winch and am building a canopy for it at the moment. Also designing a sub tank setup to fit a 75series sub tank where my spare is currently.